The new Peugeot 2008 Compact SUV enters UK showrooms next week, and its arrival appears to be very timely – when rainfall for June 2016 has already broken all previous June month weather records, having the right vehicle for the UK summer can mean needing one capable of operating in almost any weather condition. 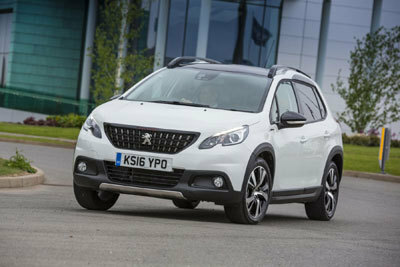 The latest Peugeot 2008 has been updated, re-styled and features enhanced specification. It has an even more assertive and appealing SUV design, including visual features to give it an enhanced presence; new wheel arch extensions (from Allure level), new vertical front grille and scuff plates (from Allure level) confirm its robustness and are designed for everyday use. The new Ultimate Red colour further epitomises the power and desirability of the new 2008. The Access, Active and Allure levels are complemented by the new sporty ‘GT Line’ model. This desirable trim level is already a very popular choice on other key Peugeot models (108, 208, 308 and 508), and adds a sporty theme throughout. The Peugeot i-Cockpit is unique to the brand and embodies the driving characteristics of the Peugeot 2008, being agile, intuitive and safe. The compact sports steering wheel offers precise steering and improved manoeuvrability while the 7” multifunction colour touch screen puts all the functionality at your fingertips. In addition, the head-up instrument panel allows driver information to be accessed without taking the eyes off the road. Grip Control - an adapted traction system - gives the 2008 its versatility on all types of terrain. It is combined with Mud & Snow (All-Season) tyres. Peugeot 2008 is also equipped with MirrorScreen, based on MirrorLinkTM and Apple Carplay, along with the reversing camera, Active City Brake and Park Assist - a rarity in this segment. An unparalleled dynamic performance is apparent in all versions. The Euro6 engines ensure high-level driving pleasure while remaining fuel efficient. Four versions are ‘Best-in-Class’ in their segment, including the 1.2L PureTech 130 S&S 6-speed manual.